SoGé Live JobinLive (France), Société Générale (France), 2008 Play it Now ! 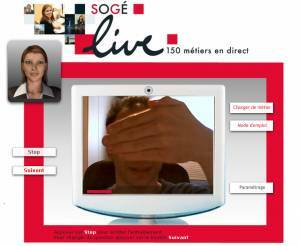 A serious game created by JobinLive (an internet and video jobseek coaching company) for the bank group "Société Générale". It's a virtual job interview simulator : pick a job to apply, and answer the questions of a virtual manager through your mic and webcam. The game record your answers and let you watch them so you can analyse and correct your mistakes before going into an actual interview.